When we say tart we immediately think of a sweet typical of the Italian tradition, the one that was created by our grandmothers and that over time has kept its taste unchanged. The tart is made with a sweet shortcrust pastry, covered with cream and seasonal fruit. There are many creams used for the topping of the tarts but the most famous and certainly the most popular of all time is the custard, decorated with succulent strawberries. In the cabaret of the Sunday pastas, where all the desserts are offered in a mini version, the tart is no exception. 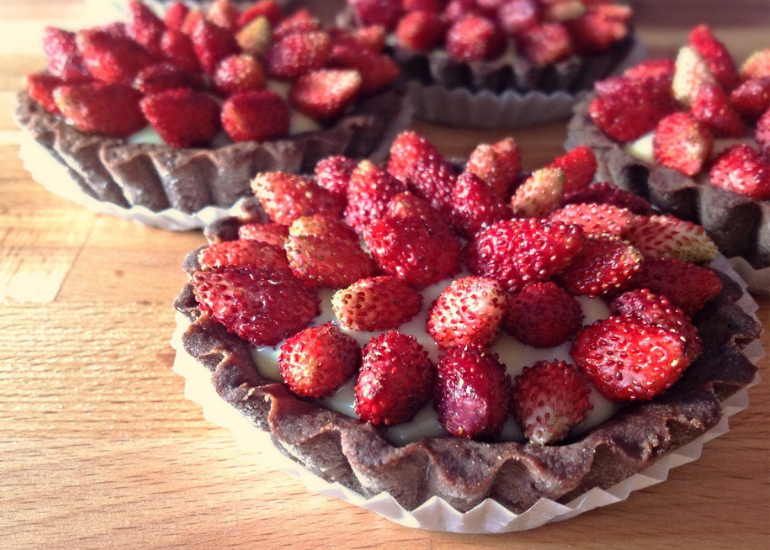 The proposal is in fact linked to the creation of small tartlets with strawberries, which are a real must have, or those sweets that can not be missing in the culinary proposals. Strawberry tartlets contain a mix of strong and contrasting flavors ranging from the short pastry fragrance, to the softness and sweetness of the custard to the slightly bitter flavor of strawberries that makes this cake truly unique. Making this dessert is not a trivial matter but if you follow the classic recipe and its preparation, the margin of error becomes really minimal. Let’s see the ingredients and its preparation together. Assemble all the ingredients to make the shortcrust pastry. Form a dough and leave it in the fridge for 30 minutes. Meanwhile, make the custard, putting on the fire a large saucepan with milk, cream and seeds of a vanilla bean. Turn on the slow heat and when the mixture has touched the boil, turn off the heat and leave the vanilla to brew for at least 5 minutes. Meanwhile, work the yolks with sugar with a whisk to get a smooth cream. When they are white and frothy, add the sifted cornstarch and mix it with the rest of the mixture. Remove the vanilla bean from the warmed milk and cream and add the mixture with the eggs. Turn on the soft heat again and stir continuously with a whisk to thicken the mixture. When the cream is thick, turn off the heat and pour it into a large, shallow bowl, cover it immediately with plastic wrap, then let it cool first at room temperature and then in the fridge then transfer it to a sac-à-poche. Grease and flour a lot of small tart molds. Create many small shortcrust cakes and roll them out using a rolling pin, then insert them into the molds; with a fork pierced the dough bake in preheated oven at 180 degrees for about 15-20 minutes. Then take them out. Once ready, let them cool completely. At this point it is time to prepare the syrup, another essential element for strawberry tartlets. Pour the water into a saucepan and let it melt the sugar over a low flame. Stir and when it starts to boil, add the filtered lemon juice. Put the syrup in a small bowl and let it cool. Then wash and remove the strawberry leaves, and cut them in two. Once the three preparations have been made, it is time to put everything together and put the custard on the bottom of the pastry. Garnish with the strawberries and brush them with the syrup. And that’s it.